382 pages | 12 Color Illus. | 74 B/W Illus. Data availability is surpassing existing paradigms for governing, managing, analyzing, and interpreting health data. Big Data and Health Analytics provides frameworks, use cases, and examples that illustrate the role of big data and analytics in modern health care, including how public health information can inform health delivery. Written for health care professionals and executives, this is not a technical book on the use of statistics and machine-learning algorithms for extracting knowledge out of data, nor a book on the intricacies of database design. Instead, this book presents the current thinking of academic and industry researchers and leaders from around the world. Using non-technical language, this book is accessible to health care professionals who might not have an IT and analytics background. It includes case studies that illustrate the business processes underlying the use of big data and health analytics to improve health care delivery. 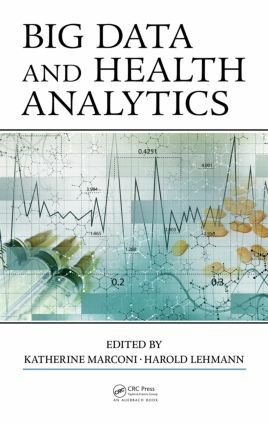 Highlighting lessons learned from the case studies, the book supplies readers with the foundation required for further specialized study in health analytics and data management. Coverage includes community health information, information visualization which offers interactive environments and analytic processes that support exploration of EHR data, the governance structure required to enable data analytics and use, federal regulations and the constraints they place on analytics, and information security. Links to websites, videos, articles, and other online content that expand and support the primary learning objectives for each major section of the book are also included to help you develop the skills you will need to achieve quality improvements in health care delivery through the effective use of data and analytics. This volume targets crucial members of the teams who will be needed to unlock the potential of big data: health care and medical professionals, scientists, and their students. It engages and grounds its readers in the issues to be faced by showing how health care practitioners and organizations are linking data within and across their medical practice on scales that only now have become possible. … I expect that readers will enjoy the nontechnical language and case study presentation by which challenges of big health care data are presented by the authors of the chapters to follow. … an accessible, excellent foundation for further specialized study in health analytics and data management. Little Big Data: Mastering Existing Information as a Foundation for Big Data; Donald A. Donahue, Jr.